Just when I thought I had my mind made up for March's album of the month, along comes Anthropia's The Chain Reaction, a nearly flawless work of traditional melodic progressive metal. Once again Hughes Lefebvre brings a concept album from his own vivid imagination. Though the story of a disappointed and contentious traveling soul is interesting, it is in the telling of the tale, the masterful music presentation, that makes The Chain Reaction more compelling. Except for a slight stumble along the way, from beginning to end, The Chain Reaction kept me interested and satisfied. Every arrangement is built upon a steady melodic foundation. From here Anthropia ventures from power to progressive metal, often weaving the two together in a highly entertaining and thrilling package. Most notable of this combination are the three back to back pieces: 'Whipping Soul,' 'The Torn Off Wing Of The Butterfly,' and 'Take Me Home.' The first is marked by an impressive bass line and a classical piano seque. The third offers a more innovative arrangement with a great groove reminding more of prog rock than metal. For strict melodic progressive metal the highlight is the longest song, 'The Tree Of Life,' which never gets dull and is filled with vibrant guitar work. My only reservation was with 'Trinity' which bordered on generic power metal with a droning and repetitive finale. However, this downturn is redeemed by an inspiring instrumental break about three minutes in. Overall, Anthropia's The Chain Reaction is first rate traditional melodic progressive metal, captivating and entertaining. I was constantly amazed at the breadth and creativity of the arrangements. This is a work well done. Highly recommended. 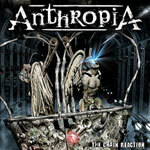 Anthropia's The Chain Reaction is first rate traditional melodic progressive metal, captivating and entertaining. I was constantly amazed at the breadth and creativity of the arrangements. This is a work well done.